Fibergrate products were chosen to replace eroded metal gratings, railing and stairways because of FRP's ability to withstand constant exposure to highly corrosive elements. The current metal gratings had become slippery and unsafe which could lead to potentially hazardous situations, so the city wanted to find a product that would provide a safe, long term, cost effective solution. The City of Wichita's water treatment plant was in need of some major upgrades. Frequent splash from corrosive solutions including liquid chlorine and a fifty-percent sodium hydroxide solution, a standard part of the water treatment process, had seriously eroded the metal gratings, railing and stairways around the plant. This erosion caused the metal gratings to become slippery and unsafe which could lead to potentially hazardous situations, so the city decided to find a product that would provide a safe, long term, cost effective solution. 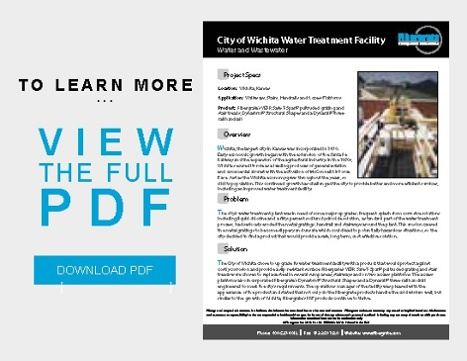 The City of Wichita chose to upgrade its water treatment facility with a product that would protect against costly corrosion and provide a slip resistant surface. Fibergrate's VEFR Safe-T-Span® FRP pultruded grating and stair treads were chosen to replace steel in several sump areas, stairways and on two access platforms. The access platforms also incorporated Fibergrate's Dynaform® Structural Shapes and a Dynarail® three-rail railing engineered to meet the city's requirements. The operations manager of the facility was pleased with the appearance of the product and stated that not only do the Fibergrate products handle the cold winters well, but similar to the growth of Wichita, Fibergrate's FRP products continue to thrive.